Described as a prequel to ‘ShadowLight’, this short introduction to a fantasy world came to me as a free download for my iPad via Kindle. A prequel is designed to tempt a reader into trying the book or series of books that follow it, of course.This is a story set in the dark and cold of Scandinavia, with references to some of the myths of that part of the world. The characters are intriguing and compelling, which is always a good start for me: I love character-driven fiction. Straight away, I was curious to know what happened to them. There are, of course, elements of the story that remain unexplained, but these didn’t get in the way of my enjoyment. Instead, they leant mystery and layers of fascination to the story, making me want to know more.The events, and conflicts, both internal and between characters, drive the story at a good pace. The language is clear and well-chosen, matching the environment in which the tale takes place. There’s clearly an element of magic, though this is never referred to as such, in the text. Some hidden and unexplained power, at war with another, darker power that is introduced skilfully, drives the actions of the characters. So much fantasy makes stars and heroes of male protagonists, that it’s refreshing to read a story in which the true heroes female. Here we are introduced to strong women, albeit under the protection of an alpha male. But the women have their own strengths and idiosyncrasies that allow them to be depicted as independent and brave; qualities that lead the reader to want to know more about them and to follow them through the story.I said at the beginning of this short review that the purpose of a prequel is to persuade the reader to read the book or books following it. Did this one do that? Absolutely. I will read this series in the future. Not immediately, because my ‘to read’ list is too long to be added to at present. But this is a fantasy I shall come back to; of that I have no doubt. Recommended. I was browsing the Kindle e-books, and stumbled across this. Wanting to read something fantastical, it looked the part, so I downloaded it and read it. The particular version also came with several chapters of Bonded, the first book of the ShadowLight Saga, and this review will address both.I wasn't really expecting all that much from the read, and that's essentially what I ended up getting, not that much.The Good: The premise of the story is fairly interesting, and I was intrigued enough to keep reading. Astrid (main character) has some interesting internal conflict, and it was kind of interesting to have a narrator who was mute, and thus not able to fully exert herself on her surroundings. There's some really lovely descriptions of setting, and the fact that it was a pseudo-Viking society becomes pretty clear quite early on. Various of the setting were quite original, such as the song of the Mother, and the idea of shadowalking. The villain (even if he doesn't get properly introduced) was pretty creepy, although the sexual tension...really doesn't make sense. Yes, the dark side is seductive, but...why literally?The Bad: While I haven't read the entire saga, I'm pretty sure my predictions for the ending are spot on. It's a variant of a plot we've read multiple times before, although I will give it kudos for doing it in a new and different way. I have a basic understanding of Norse mythos and Viking culture, but a lot of concepts brought up were unfamiliar to me and could have used a little bit more introduction. The use of nei for no and ja for yes irked me. I understand that it was to establish the foreign setting, but if all the characters are speaking the same language, the necessity is gone.The Ugly: There was a whole lot of action and angst, but there was no down time to digest, and a lot of internal conflict resolved itself incredibly quickly. A lot of relationships were established, but rather than being shown, were described point blank. I came away from the prequel and preview of the next book feeling unfulfilled, because there was a lot of stuff going on, but it lacked substance. I'm not going to touch the fight scenes, because they do what they're supposed to do for the plot and establishing characters.Will I keep reading Bonded? Probably not. If you want something fluffy that is a quick read, then you may enjoy this book. If you want something to sink your teeth into, this book is not for you. The Light Keepers was a very intriguing read the has my interest piqued to read the series. This was just a prequel so it made for a quick read. Astrid has been trying to find her voice all her life so she can sing to the Mother to get the power of light to protect from the Shadows. It was a little confusing at first, but a few answers were given, and I am sure it will all come together with the next book. This one teased of romance to come and maybe even a sort of triangle. It will be interesting to see what happens there. Look forward to future books by this author. It was a fun and quick novella, that got me started into the series. I immediately bought the first book, after a few free chapters contained here, which I guess made it a very efficient novella at that! :)Fun and quick, kind of mysterious. The main character, Astrid, can't find her voice. There is lots of magic and inner torture. A battle between her inner light and inner darkness. I'm looking forward to this first book! The Light Keepers is a short story proceeding Mande Matthews' ShadowLight Saga. Calling it a short story may be an exaggeration, though; I'd say it's more of a teaser. The story ends before a full plot can develop. Instead, this prequel sets the stage for the saga by introducing the world and providing history on a principal character. It does its job, though. I was intrigued enough to be indignant when it ended.Matthews spins the tale as if we are already familiar with her world and yet does not leave the reader confused. She introduces unfamiliar concepts but provides enough information in the next paragraphs to explain them. Similarly, most questions brought up in the text are answered. The ones that are not will most likely be answered in the saga. The overall quality of her writing is above average, but not impressive, and here's why:Hiccups occur with characterization. Astrid is not as deep as I would hope for a protagonist. I know that she is lonely, but I don't feel it. Isla, Astrid's mother, is also flat because there is not much interaction between mother and daughter. Balin, Isla's warrior, is the easiest to understand. He lives for one purpose: to love and protect Isla, which extends to protecting Astrid.I also reviewed this book on my blog. Beautiful, really.It´s refreshing to read something different.The only thing is that I´m Nordic and I feel protective about our cultural heritage and therefore I´m a bit disturbed that this is used that way. Don´t get me wrong, I appreciate that people find nordic mythology interesting but it still hurts to see it in such a.. fictional way. It has nothing to do with just this book, but with all books that use mythology as their main focus. I guess I´m never going to be completely okay with it.I don´t have any complaints considering the characters, story or the writingWell done. This was a free book, a prelude to the series and with nothing to lose, I started to read. I enjoy reading about Norse mythology and the concept of this story interested me. Whilst being a short story, it gives you just enough to let you gauge the intricate world building the author has envisioned. I liked the idea of Astrid and her struggle to survive so I purchased the first book in the series. I liked this free story and 8 chapter preview enough to buy the first book for my Kindle. I like books about quests and girls with swords and this has both. Some of the descriptive passages are a bit wordy and lengthy, overall I like this novella. I liked it; it felt like it ended rather quickly (But I'm assuming it carries on in the first book Bonded) so I will more than likely grab that book and carry on.Very nicely written; kept me gripped the entire time. Another YA fantasy that I couldn't get into. Nordic gods and the like. Wow...breezed right through this...has me hooked...now looking for the series. Just enough of the story to tantalize and leave you wanting more. A great intro of characters and plot. I look forward to the series! 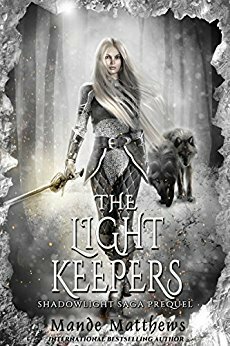 The Light Keepers is a short prequel novella, giving some insight into the characters of Astrid, her mother, guardian, possible enemy, and possible destiny match. Whilst not giving away too much, it does give you a quick taster into what the next book, Bonded, may offer. What isn't clear is the world set up - what is the Shadowwalk? Why is it evil? Why did Astrid's mother become ill the further from home she got? Why can't Astrid speak? These answers I presume will be in the full length novel, the first eight chapters of which you get at the end of this book.An intriguing start to a series that has definitely tweaked my curiosity. What a teaser!This one very good short story and teaser. You definitely got my attention.Though a classic fantasy, it does have elements of a "party" in RPG like DragonLance and Forgotten Realms novels. In fact, I am confident to say at this point that this series ranks in the same greatness as DL & FR.So, on to reading the rest of it! I can't complain about the price since it was free. The entire story could have been wrapped up in a few sentences and I don't feel as if I understand Astrid, AKA Swan, any better than before I read this. Well written, though short. Perfect prequel short story. Wonderful! I went into this doubtful, but finished it hungering to find out what happens next! Can't wait to read the first book. find this review and more at https://maginibooks.wordpress.com/As usual I was browsing through some fantasy freebies on Amazon to find a story that might be interesting enough, maybe a beginning of a series to have something for a start. There are thousands of books there and it’s not easy to get onto the one you’ll actually like.I have to admit, I’m usually tempted by a pretty or an interesting cover, so I don’t always hit the spot. I’ve read many boring or simply badly written stories, or rather started reading, because I don’t feel that I have to finish every book I’ve started. There’s so many of them after all, so why would I coerce myself to the book I don’t like?Anyway, let’s head to today’s read and be warned, this one might contain some SPOILERS!This short story is an introduction to the ShadowLight series. Everything happens in Viking-like environment. Crackling snow, strong heroes and mysterious magic inside our heroine lures us into reading this story.Story’s starting with a fight. At first it seems like a fight till death. Astrid stays in hiding to attack her mother’s lover. On her side is the element of surprise and her silence – she was unable to give any sound out of her since she was born.This scene felt like instead of fighting they will simply fall into each other’s arms and make out on the snow right there and then. The way she described Balin seemed like she’s really into him. And few moments after that she’s staring at some young hot Viking on who she’s “spying” during shadowwalk.Yes, at that moment I thought it will be typical PWP story. And to tell you the truth I still do.This story has some good sides. Author did well using characters thoughts as a manifestation of her feeling, showing her inner struggle. Since the girl can’t talk this is the only way she could present us with her opinions.Then again it seemed strange to read about her contacts with others, especially her mother. It felt like mother was answering to everything the girl though. I guess I can understand that it might’ve been how those two were always communicating, so they naturally understand each other. I guess it just didn’t feel that natural for me.And there was this weird interaction between Astrid and some strange man she just met during Shadowwalk. I completely couldn’t understand this sudden attraction between them.Yet again I felt like he just wanted to drag her to bed and it was only because she was right there doing her shadowwalking thing. Well off course you can imagine him looking like Loki…But even this couldn’t convince me to read the whole series. Hot villain is one thing, but some good plot is what I prefer.Story is still free on Amazon, so you can check by yourself if you’ll enjoy the story or not. It seems it got quite many positive reviews. This is one of my Kindle freebie grabs that I half-heartedly opened out of desperation thinking I had nothing but time to lose. The result was me gripping my Kindle, debating how soon I could get the rest of the story.The plot:This is a brief book that still boasts sword fights, magical intrigue, and deeply rooted mysteries. I found myself enjoying it far more than I expected to and whizzed through the brisk plot in no time at all.The characters:We do see some of Astrid’s mother and her mother’s protector, who is also Astrid’s teacher. However, the main focus is undoubtedly on Astrid. Astrid has many frustrations, mostly about her inability to speak and her lack of understanding just what it is her mother and mother’s protector are preparing her for. It was easy to understand why she got so angry, even if it was also easy to see why they pushed her mentally and physically. I don’t usually find rebellious characters sympathetic, but I adored Astrid and I was very eager to read Bonded.A plunge into a fantastical world based on Norse mythology complete with dark lords, mystery, and lots and lots of sword fights. I highly recommend this series and am eagerly awaiting the third installment. The Light Keepers is set in Scandanavia with references to norse mythology. We come to meet Astrid; a mute who can enter the shadowwalk. Yet, whilst in the shadowwalk she puts herself and those around her in great danger. If only she could sing she'd be able to tap into the source of the power of light and be able to protect herself.I found this on amazon whilst browsing for short stories. It was free so I thought why not? It wasn't so much of a short story, more so a teaser to help introduce characters and the setting. It doesn't get into too much but it's enough to grip you and has made me seriously consider reading Bonded. This is a very well written Intro, to her series. As usual it stops at the most interesting part, to get you curious as to what happens next...The Light Keepers is a Prequel to The Shadow Light Sage and readers get to know Astrid, a lonely girl with powers. I love the emotional conflict and the mystical detail of the story. Astrid does not have a voice, yet she silently communicates with her protector, while being watched by the Shadows. If she slips into the Shadow world, she will be lost to the Light and then will be part of the darkness herself. I am curious to discover more about the prophecy. A young girl , Astrid, is take into hiding by her mother. Her mother has seen a prophecy that Astrid guard her people against the shadowland. "The shadowwalk is a dark and evil thing." It calls to her and she can't seem to sing her song of protection. Before she can go to the man in her dreams she needs to protect not only herself, but him as well. This was a great beginning to what seems like going to be a great series. The series would be a wonderful read for any child who loves fantasy. Sword fighting and girl power what could be better? Find out if Astrid learns her heart song and is able to find her love before it's too late. Mande Matthews - Mande Matthews is the author of the ShadowLight Saga. Her debut novel is "Bonded" - book one of the ya epic fantasy trilogy. A free prequel to the ShadowLight Saga, entitled "The LightKeepers" is now available for free at most online retailers. While attending a performing arts college for writing and arranging, Mande discovered Joseph Cambell's Masks of God series. Her desire to understand humanity through myth and legend mingled with her love of fantasy fiction, birthing her life-long quest to create original new worlds for readers. A hermit at heart, Mande recedes into the realms of imagination where she occasionally surfaces to face the real world aided by her minions: a husband who plays the dog drum (the belly of their border collie), and a menagerie of furred, feathered and mostly magical friends.